As its core, HD Log Gold is a highly customizable database used to log analog, digital or previously captured video files. The Gold version of HD Log can also capture video using firewire and serial interfaces. Literally dozens of additional capabilities make this application worthy of a long look for editors seeking to streamline the tedious logging process. Three versions of HD Log, each with different capabilities, are available from Imagine Products. A comparison of all is available at the company's web site. Data can be viewed in the clip or index view, and using both views. The index view permits you to "mark" a clip to be revisited and/or exported. Clips can be sorted in the index view using the sort function and exported in a variety of text and database formats as well as HTML with thumbnails. 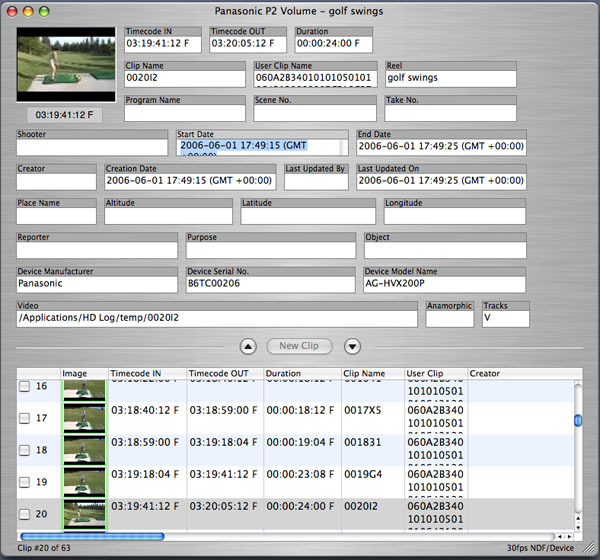 HD Log's initial appeal is its ability to customize a template/log sheet to suit the video source, the project and the editor. 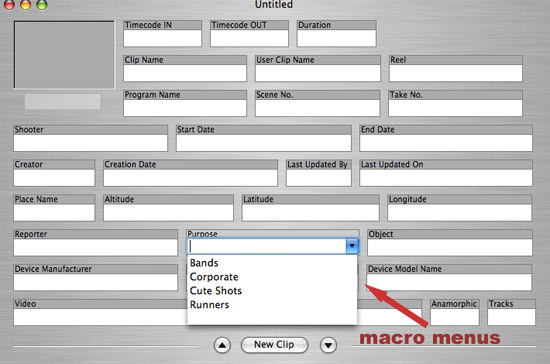 The template can include any descriptive field the user determines to categorize the clip. Templates can be tailored for unique or recurring fields, to assign a default value to each field, its attributes, size, and position in the database interface. Fields can include drop down menus to speed text entry. 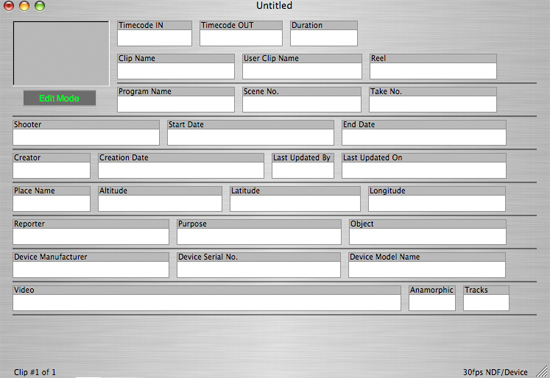 Others fields can be configured to copy entries from various fields in the previous clip when a new clip is created. Fields are accessed successively by the tab key and move right to left and top to down. Templates are customized for use while in the "edit mode" which enables fields to be repositioned, enlarged, renamed, or deleted by control/clicking on the field. Additional fields can be added by control/clicking on the area of the interface and adding a new field. Fields are defined to correspond to the type of information that is being logged. These categories include: text, auto increment (to automatically name new clips by numerical increments), date, quantity, time code, video, text with menu, etc. Up to 50 template fields are available for each log template. The type of footage and its intended use determines the character and complexity of a template. For many uses, time code, duration, and notes are sufficient. One key time saver is the use of Macro Menus. This feature uses recurrent text entries available from a drop menu to make logging information consistent throughout the log sheet. For example, if you are logging clips to be categorized for use in separate parts of an edit, assign a field as "text with menu entry" to quickly access the various categories a clip falls into. Then upon export, you can sort by that field. Normal copy/paste, undo and other text conventions apply for text fields. Up to 5,000 characters may be entered. Date entries aids extend simply typing a "d" in a date field to automatically enter the current date. When you have completed logging your footage, the database can be sorted to include those clips you wish exported to your NLE. HD Log exports batch lists to Final Cut Pro HD, Avid, Media 100, Adobe and Sony's products among others. It will also import EDLs and list files. Check the web site for compatibility. 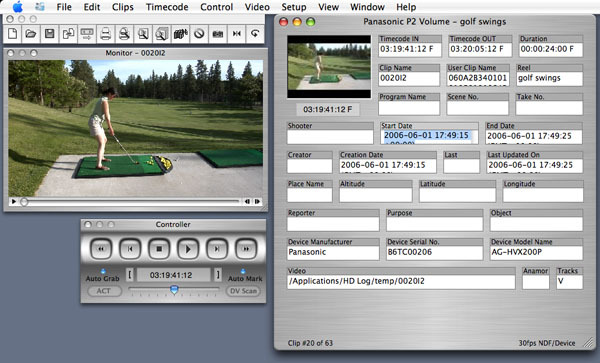 Beside NTSC DV logging and capture, Video Assist will log and capture to any hardware codec supported by your system. Imagine Products has successfully tested the app with all AJA, Black Magic and Aurora cards, DV, and Canopus ADVC 110 boxes. A fully functioning transport controller with JKL support, shuttle, and cueing capabilities is included. FireWire capture from the Panasonic HVX200 is also supported. Make certain your drives are have the necessary capture capability. Imported p2 clips can be marked, sorted, trimmed, and manipulated in various ways. You can force the app to assign a new "user" name for each clip, which the clip retains in a XML export FCP 4.5 or higher. Upon the export, the bin includes the trimmed clips with the names you assigned. This is a huge timesaver for editors. Only HD Log permits trimming and sub clipping. Both HD Log and the recently released p2 Log app can assign user clip names upon export. There are dozens of other features that I haven't touched in this review. For example, the application has a DV Scan feature for indexing tapes and a patented scene detection technology based on color changes, extensive sort and search features, and network based digital library sharing. Its capabilities will be fleshed out as you apply it to specific logging and capture tasks. As I stated before, some may balk at the $699.00 price tag for the Gold version of HD Log, and understandably so. Some of its features may not be useful to a good percentage of editors. If this is your situation, there are lesser-priced versions of HD Log whose features better correspond with your workflow. Visit the web site to gauge what you need and at what price point. In any case, this is a well-constructed application that provides an excellent interface to meet the tedious work of logging footage, and more.